Tanjant Tool Co builds circle guides for better plasma cutting (also known as Circle Burner Attachment). 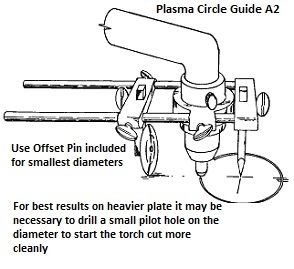 The designing of Plasma Circle Guide is for a precise internal profile fit for your torch. Select the Brand/Model from the list, and as a result, matching guide(s) will be displayed (Part No’s TJ1087A to TJ1204V). Click on the Thumbnail Picture to open the full product page. The specific adapter bushing is factory fitted and supplied as a complete circle guide pack. The unique twin bar configuration enables precise circle cutting from a minimum of 38mm (1-1/2”) diameter. The diameter may vary with some torch heads. Also, making it quick and easy by rotating the frame in one continuous action. Furthermore, Plasma circle guide parts can be moved around on the unique twin-bar frame to allow inside and outside cutting. See more detail with the “How-to-Use” button and Picture Gallery. Tanjant’s free-rolling guides support plasma torch tip at optimum height (usually around 1.5mm or 1/16″ off the metal surface). The height allows smooth cutting speed and eliminates drag related tip damage, giving better results and improved cutting tip life. Tanjant plasma circle cutting guides save cutting time and effort while protecting the torch and delivering real benefits well into the future.